My summer got a bit shuffled last week when I found out some good news: my publisher wants the galleys of Shift, the sequel to Shade, to go out early this fall to their sales contacts. Which is fantastic, because it means that we'll probably see some cover art sooner, and the bookstores will have more time to read it and get excited. So you know that RWA Nationals Conference I was going to attend the last week in July? Not so much now. No point in spending money (that I really don't have, anyway) to sit in my hotel room working on line edits. My apologies to readers who were planning to say hi to me at the Literacy Signing Wednesday night. Instead I'll be doing some fun online launch stuff for Bring on the Night! 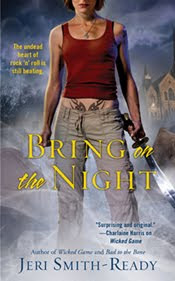 The party has already started this week at All Things Urban Fantasy, where I talk about how much I hate spoilers, make an important announcement about ARCs, and where you can win one of two copies of Bring on the Night itself. Oh, and the first two chapters of Bring on the Night are now up! I got permission to post more than one chapter, seeing as Chapter One is only five lines long, and including that alone would just be mean, even for me. Let It Bleed, after the Rolling Stones song and album. Which I will also officially announce when it's official. LOVE LOVE that title for book 4!! Hope it stays. Thanks, Karen! I hope it stays, too. My editor loves it as well, so I think that pretty much makes it official. I concur -- I hope the title for #4 sticks. Good luck with the frantic editorial schedule! yay for SHIFT! i can't wait to see the cover and get a look at it when i can.....! !